The Rocky Mountain Institute’s Garrett Fitzgerald analyzes the results of Stem’s history-making aggregated energy storage bid into the California real-time energy market. Earlier this month, energy storage developer Stem aggregated a fleet of behind-the-meter (BTM) energy storage systems and successfully bid into the California Independent System Operator (CAISO) real-time energy market as participants in PG&E’s new supply-side pilot. Simultaneously provide both customer- and grid-facing services. This has been demonstrated by other behind-the-meter projects in the past as evidenced by two projects in SCE territory announced last year. But this is the first time, to our knowledge, an aggregated fleet of behind-the-meter storage systems have combined real-time wholesale market services with customer services such as demand charge reduction. Reliably deliver and be compensated for wholesale energy products in the real-time market. Most batteries being installed today at customer premises are vastly under-utilized, often being dispatched or charged 5–50 percent of the time. That’s what makes this pilot such an exciting development. It is a first step towards multi-use, highly utilized energy storage deployment and is just the tip of the iceberg regarding the future role of DERs in the electricity system. 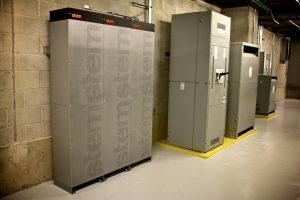 Storage systems like Stem’s in the PG&E pilot generate revenue by delivering two sets of services: a) they reduce customer demand charges and b) they earn revenue from market participation. They can and should do both. However, developers will face a decision: Should the system be optimized to provide demand charge reduction? Or should it focus on market participation? This balance is important since system size, configuration, and economics can look quite different when tailored for one application vs. another. Using an hourly storage dispatch tool to simulate commercial demand charge reduction, we can estimate the required system size and monthly bill savings for a small hotel in San Francisco. If we optimize the storage system from a cost/benefit perspective and consider demand charge reduction as the only source of revenue, our model indicates we should install a system with about one hour of storage capacity and a 20 kW power rating. This system is capable of reducing the building’s peak by about 5 percent and saving the customer roughly $235 per month on demand charges. Whenever the system is not constrained to manage the hotel’s peak load, it could be aggregated with other nearby resources and bid into the California wholesale market under something called the Proxy Demand Response product. Operating the system in this way increases the utilization rate of the battery compared to demand charge reduction alone and opens up two new sources of revenue: a capacity payment for providing demand response in the CAISO and an energy payment for providing day-ahead and real-time energy. For the capacity payment, participants in Proxy Demand Response commit to a monthly minimum of 72 bid-hours that are bid in four-hour contiguous bid blocks. Participants receive a capacity payment of $6/kW of capacity each month. A demand-charge-optimized system (the one above with 20 kW of power and one hour of discharge capacity) can discharge at full power for only 1.25 hours before the battery is fully depleted. For this system, the four-hour requirement constrains the system to a maximum capacity bid of only 6.3 kW, about a third of its rated power capacity. With this constraint, the system owner receives a monthly capacity payment of $38 through the Proxy Demand Response market. In addition to the capacity payment, the system owner or developer is compensated at the day-ahead market price for actual energy delivered, and any delivery over or under the initial bid is compensated, or penalized, at real-time market price for the time of delivery. Interestingly, the revenue generated from the day-ahead and real-time market (which is the revenue stream primarily touted in media coverage of the Stem pilot described at the beginning of this blog), only brings in about $5 per month to the system owner or developer. Pulling all these revenue streams together, this storage system that’s optimized for demand charge reduction creates about $275 in monthly value for the system owner or developer. We can then estimate what such a system might cost to own and operate. Assuming an all-in cost of $400 per kWh and an additional $800 per kW and a 20 percent financing adder, this system would cost about $265 per month. Under these conditions, the developer and/or system owner finds themselves in a cash-positive scenario. Without any increase in spending by the customer or the grid, this battery can increase its revenue by ~20 percent, while reducing the need for expensive and polluting peaker plants. Now let’s explore these economics for the same hotel owner assuming the system is instead configured and optimized to participate in the CAISO market through the Proxy Demand Response program like Stem’s batteries under the PG&E pilot. In this case, our model increases the size of the system in order for it to provide four hours of continuous discharge (versus one hour in the Option 1 scenario above) at its full power rating. With these constraints, the optimized system has a resulting configuration of 65 kW and 240 kWh, nearly three times the power and 10 times the energy of our first example and capable of reducing monthly peak demand by 15 percent. In this scenario, the customer’s monthly demand charge is reduced by nearly $670, much greater than the $235 that we saw in our first scenario. However, sizing the system to provide a 15 percent peak reduction with four hours of capacity also increases system costs. Unlike the system we explore in the first scenario, this system can bid its full power capacity as a Proxy Demand Response product, collecting nearly $360 per month from capacity payments and about $40 per month from day-ahead and real-time wholesale energy sales—about an order-of-magnitude increase in revenue compared to the first scenario. Operating the system in this way creates a monthly value to the hotel owner of about $1,070 but costs about $1,450, hence it isn’t cash positive. Evaluating these two scenarios we can see the importance of properly sizing and utilizing energy storage. In this particular case optimizing the system for customer-facing services produces a cash-positive scenario while optimizing for market participation does not. Allowing dual uses (and we’d argue many more) will make batteries cost-effective without any incentives much quicker. With today’s economics, batteries can get the bulk of their value supporting the customer. In this case, we modeled demand charge reduction, but customers also value batteries for resilience, power quality, and other aspects. Given the vibrant market in customer-sited batteries today, allowing those batteries to contribute to wholesale markets can help manage the grid, reduce central infrastructure requirements, and reduce carbon, at zero marginal cost and with cash to the customer. 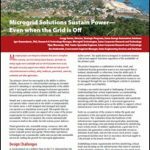 When evaluating the tradeoffs between new peaking infrastructure, new grid-side batteries, or using customer-sited batteries, the economics will likely be best when looking at customer-sited batteries that can provide both customer- and grid-facing services. This simple exercise highlights how a system optimized for one application is likely suboptimal for any secondary application. Increasingly, as multi-use stacked business models become the norm, developers will need to decide which storage application is the primary focus of the system and what other secondary revenue streams should be captured, a decision that will dictate system configuration and operational parameters and subsequently the project economics. This blog originally appeared on the Rocky Mountain Institute’s (RMI)’s Outlet Blog. Author Garrett Fitzgerald is a senior associate in the electricity practices at RMI.